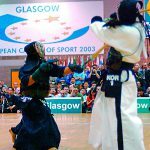 Kokushikan University boasts the most wins at the All Japan University Championships. 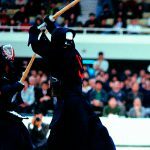 Kokushikan is known as the top university producing countless famous kenshi, but the team in 2012 is said to be their strongest team yet. 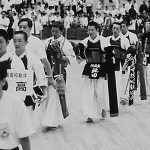 They had two All Japan University Championship winners (Sho Ando and Hiromichi Fujioka), a 3rd place player (Kimitaka Nakazawa), 2nd place player from the Kanto games (Ryusuke Sugano), 3rd place player from the same competition (Yuki Tsuchiya), and two players in the top 8 of that competition (Rentaro Kunitomo, Naohiro Takeda). Everyone had superb individual records. Sugano and Tsuchiya were 3rd graders, and the rest were in grader 4. Another 4th grader, Yasuhiko Murakami, who had a good record in team games, joined as the 6th 4th grader. It was a well-organized team of older graders. 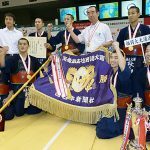 In the Kanto Student Championship, held before the All Japan Championship, Kokushikan defeated Chuo University 4-1 in the final to claim the title. In the All Japan games Kokushikan faced Chuo University again in the final. This time it was a close contest. 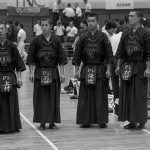 Senpo Tsuchiya claimed a nihon win, and after Takeda held for a draw, gosho Murakami claimed a nihon win to give Kokushikan a nice advantage. But Chuo put up a good fight to come back. Chuo’s Chuken Shogo Saito defeated Kunitomo in an ippon, and after drawing the gosho match, Fukusho Yuma Iwane beat Fujioka in an ippon. Kokushikan were ahead by 2 in points, but in games it was a 2-2 tie with the taisho match to come. Kokushikan’s taisho Ando played hard in a very tense taisho showdown. He saw off Daiki Miyamoto with a degote and men. Chuo University nevertheless put up a great fight, showing themselves to be even with one of the strongest teams in history. At this point, Kokushikan had claimed their 14th win in the competition. 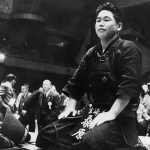 Ando went on to win the Police Championship; Kunitomo gained 2nd place in the All Japan Championship twice; Fujioka won the Teachers Championship. See how these players performed after graduation, it is safe to say that Kokushikan did indeed have one of the strongest teams ever.